I have my lights, heating and security system all under voice control with Amazon Alexa (see my articles) and now I can control my router. 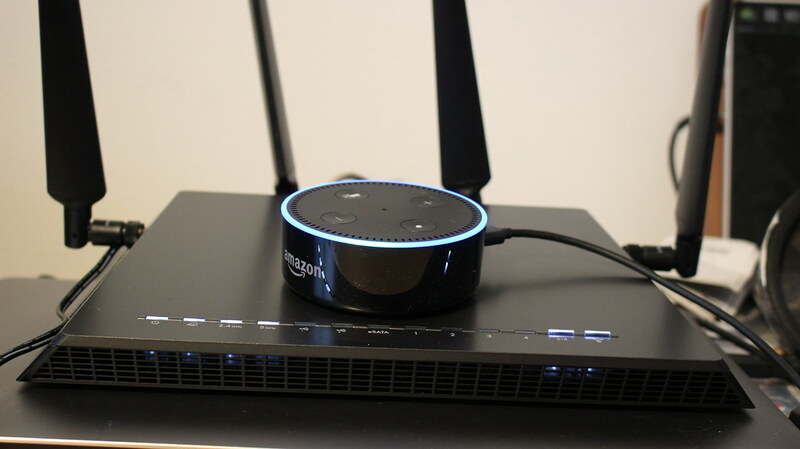 A couple of weeks ago Netgear added Amazon Alexa support to some of their routers that enables Amazon’s assistant to control the devices. In this video I setup my router to work with Alexa and show the available commands. As you can see in the video there are a few steps to get the router and Alexa working together. I found that at first I was unable to enable remote access with the app telling me the feature was not supported. So I updated the router firmware to the latest version and that fixed the problem. Enter you Netgear account details. If you haven’t already created an account you can do it from the Netgear Genie app. Alexa, ask NETGEAR to send me my WiFi settings. When you enable the guest network or ask Alexa to send the wifi settings Alexa creates a card in the Alexa app with the account details. As Alexa responds to commands from anyone it means that anyone within shouting range of your router can reboot it so consider that before enabling. I found the most useful part is sending over the wifi details when you are going to be adding a new device to your network. Being able to enable and disable the guest wifi is also hands. Probably less useful is rebooting the router, most of the times I need to reboot the router is because there is a network problem so if the internet is down then Alexa won’t work anyway.